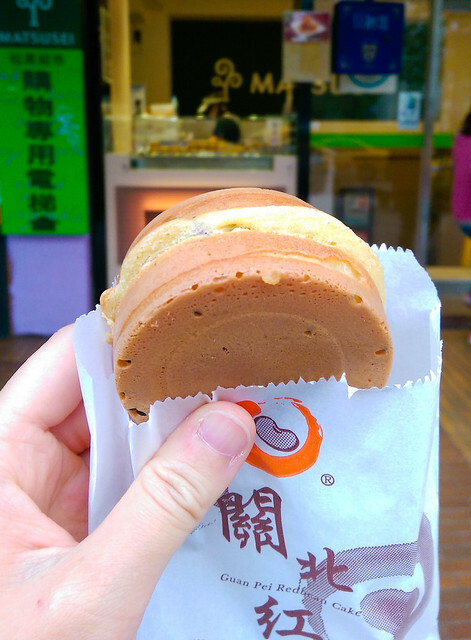 Red bean cake (紅豆餅) is a popular Japanese dessert in Taiwan. In the Greater Taipei area (Taipei, New Taipei City, Keelung, and Taoyuan) this dessert is called car wheel cake (車輪餅). My sister and I passed by a red bean cake vendor in front of Matsusei, a grocery store chain, in Da’an District. As my sister and I were walking towards Da’an Forest Park from Yong Kang Beef Noodle, we caught a fragrant smell of something baking. A few steps later, we stopped and backtracked the scent to Guan Pei Red Bean Cake. Even though I was still full from the beef noodle soup, I didn’t want to pass on an opportunity for a car wheel cake! The red bean paste was thick and mashed (had beans; was not smooth). It also tasted mildly sweetened, which seemed to be a recurring theme with Taiwanese sweets. Desserts and beverages are über-sweet in America when compared to Taiwan! Imagawayaki (今川焼き) is a Japanese dessert often found at Japanese festivals as well as outside of Japan. It is made of batter in a special pan (similar to a waffle iron but without the honeycomb pattern), and filled with sweet azuki bean paste, although it is becoming increasingly popular to use a wider variety of fillings such as vanilla custard, different fruit custards and preserves, curry, different meat and vegetable fillings, potato and mayonnaise. Imagawayaki are similar to Dorayaki, but the latter are two separate pancakes sandwiched around the filling after cooking, and are often served cold. Imagawayaki began to be sold near the Kanda Imagawabashi bridge during An’ei years (1772 – 1781) in the Edo period. The name of Imagawayaki originates from this time. 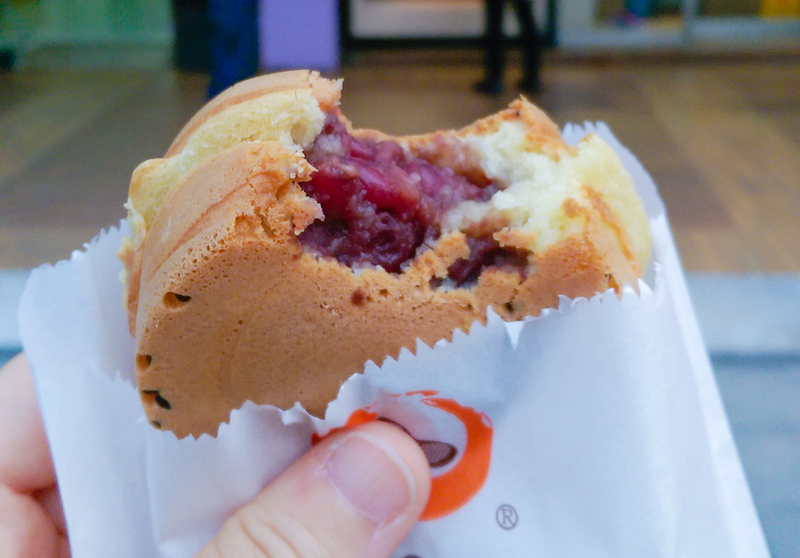 In Taiwan they are commonly called “red bean cake” (Chinese: 紅豆餅; pinyin: hóngdòu bǐng). In the greater Taipei area they are referred to as “car wheel cake” (Chinese: 車輪餅; pinyin: chēlún bǐng). However some of the older generation may directly use the Japanese term Taiko manjū (太鼓饅頭).